You know those yoga pants you wear on the weekends? Why not up the style ante and keep the comfort of a yoga waistband with the sophistication of a long flared maxi skirt? Easy to wear on your errands with flip flops, but pair it with a dressy top and some wedge sandals for an elegant look. 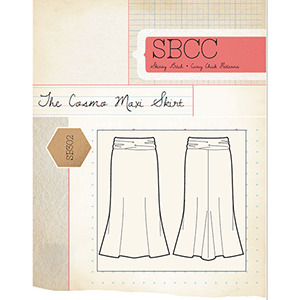 This skirt is perfect for the stick-straight petites, but also for the curvy girls who aren’t afraid to show it off. Silhouette is engineered to taper higher than normal and the flared hem is not too overwhelming. If you need it shorter, roll the waistband. If you need it longer, extend the waistband so the seam falls at the hips. 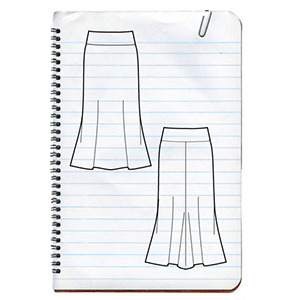 This easy maxi skirt sewing pattern sews up in a minimal amount of time. This pattern is available in sizes XXS to 3X. Suggested fabrics are stretch knits such as cotton jersey, cotton lycra or lycra spandex.